• OLD SCHOOL VIDEO HISTORY (March 21, 2002) – WWF SmackDown! This episode was pre-taped at the Corel Centre in Ottawa, Ontario, Canada and featured matches, interviews & storyline segments on the road to the ‘WWF Backlash 2002’ PPV. 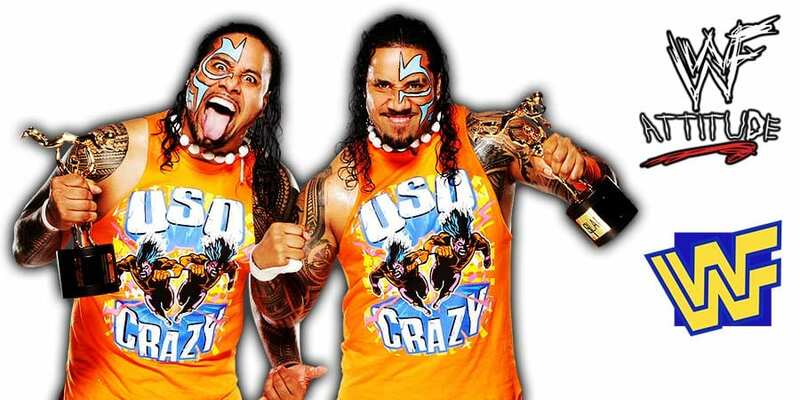 As we noted last month, SmackDown Tag Team Champion Jimmy Uso was arrested after a dispute with cops. “WWE Superstar Jimmy Uso — half of the popular Usos tag team — was arrested after a drunken dispute with cops in Detroit … TMZ Sports has learned. The 33-year-old — who’s the son of WWE HOF’er Rikishi — and his wife, fellow WWE Superstar Naomi, were pulled over near downtown Detroit … after cops say Naomi was driving the wrong direction on a one-way street. According to our police sources, cops say their 2018 Dodge Journey reeked of booze … so they ordered Naomi out of the car. We’re told while Naomi talked to cops, Jimmy got out of the car — despite commands from police — and took off his shirt and jacket and squared up like he wanted to fight. We’re told the officer took out his taser ’cause he was scared for his safety. Jimmy ultimately settled down and complied with their commands … then he was handcuffed, and arrested for disorderly conduct and obstruction.